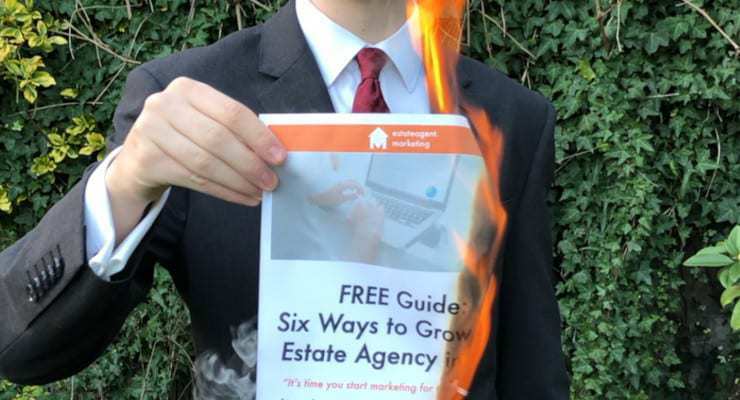 We all know that valuations are one of the biggest leverage points for generating more revenue, if you own an estate agents. Looking to make more money? Book more valuations. Struggling to make enough money? It’s (partly) because you haven’t booked enough valuations. and if your company isn’t doing enough valuations, it’s usually because too few people are finding you. So… how do you get people to find you, so that you can book more valuations and make more money? We’ve been getting our clients in front of thousands of local homeowners who are looking to sell their property. This allows the homeowner to step forward (instead of being chased) and ring up when they’re looking to sell. This way, our clients make more money by booking more valuations by being in front of more people! So, we’ve put together a FREE guide that’s we use everyday as our playbook for getting our clients results. Why are we giving it to you for FREE, if it’s so great? Because we hope that you’ll find it so useful that you’ll naturally want to take our other great offers where we massively over-deliver on value for the price that we charge. A much better way of doing business than being cold called. Also, we have to stay congruent – if we’re telling our clients to market themselves one way, we’d better be doing the same ourselves. So here we are! Click the link here, and let us know what email address you’d like us to send the FREE Guide to.